8846 Aguamarina -1 Bed With Stunning Views And Wifi. Beautifully furnished fourth floor one bedroom apartment located in a fantastic position within Golf del Sur with shared pool. Large balcony overlooking the pool and sea front with stunning views. This lovely 1 bedroom Apartment offers wonderful sea views and wifi. The apartment is particularly comfortable and offers good quality accommodation. A 50 inch LG Smart TV, surround sound, remote control lights and fans are all examples of the extra touches that increase the popularity of the apartment. It now also has a mobile air conditioning unit too! Situated on the 4th floor it has a fantastic position within the complex. With a large balcony overlooking the pool and the Atlantic ocean, you are guaranteed to offer stunning views! Although it's on the 4th floor, you actually enter on this floor. This is because the complex slopes down towards the sea, so when you get to the balcony you are still high up which is why you get those lovely views! Inside the apartment you can see the Altantic from virtually every room! With those delightful balcony's sitting over the Atlantic, you will be lulled to sleep by the gentle sounds of waves lapping against the shore! The kitchens are fully equipped with a full size oven and hob, microwave and fridge/freezer. There is a breakfast bar separating the kitchen from the lounge. The lounge consists of two sofa's, a radio/cassette/cd player, A DVD Player, V, Surround Sound and 50in smart TV with Amazon prime account for movies. plus BBC1,2, ITV, CH4 and Sky Sports one. There are patio doors leading to the large balcony. The bedroom consists of a queen size bed, fitted wardrobes and a chest of drawers. It also has patio doors leading to the balcony. The bedroom also has a flat screen TV and DVD player! The fully tiled bathroom is extremely fresh and clean. The complex has lifts and is wheelchair friendly. The main doors to reception are kept locked so it is very safe and secure. It's very well maintained and each floor is cleaned every day. The apartment has its own private underground parking space. The complex is extremely well situated for all local amenities. Opposite is a well stocked supermarket and an Irish Bar that shows all the major Sporting events by day and has some good quality live acts in the evening. At the front of the complex, there is a picturesque sea front promenade with some typically Spanish restaurants and bars. Full Size Oven & Hob, Microwave, Fridge/Freezer, Electric Kettle, Toaster, Breakfast Bar with Stools, 2 Sofa's, DVD Player, 50in smart TV with Amazon prime account for movies. plus BBC1,2, ITV, CH4 and Sky Sports one, Radio/CD/Cassette Player, Ceiling Fan, Mobile air conditioning unit, Patio Doors to Large Balcony. A full size double bed is provided. Queen size bed, Fitted Wardrobes, Chest of Drawers, Iron, Ironing Board, Ceiling Fan, FULL English TV (BBC, ITV, CH4 and SKY), DVD player, Patio Doors to Large Balcony. Bath with Shower, Wash Basin set in a Marble Top, WC. South facing. Table and 4 Chairs, Clothes Dryer, Stunning pool and sea views. 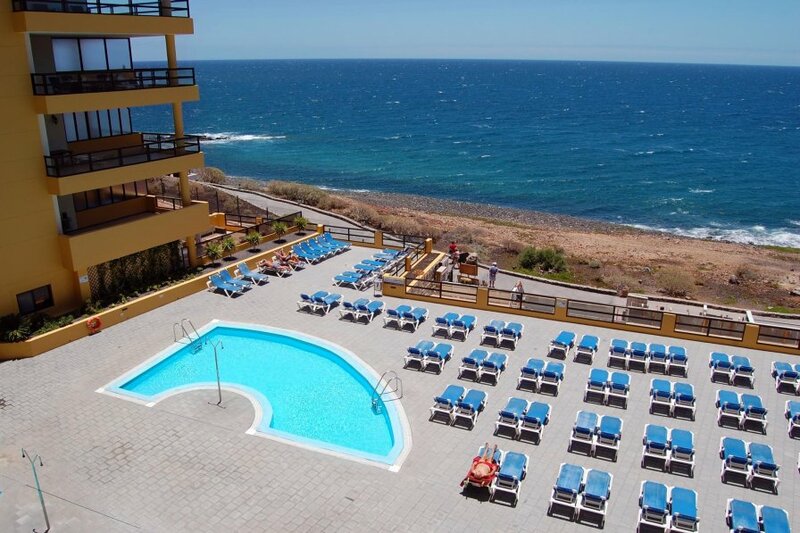 10 minutes from Airport, 10-15 minutes to Los Cristianos and Playa de Las Americas (by car). Hourly bus service also available to both the North and South of the Island. Taxi rank within 2 minutes walk. This apartment is looked after by a Local Management company who have staff in the resort centre of Golf Del Sur. After you have booked, their details will be sent to you so. They will also contact you with a map and your key collection details prior to your stay and of course can answer any further queries you may have. Many people book these apartments reassured in the knowledge that they are close by should you require them. The complex has lifts and is wheelchair friendly. The Pool is heated!